Personal reflection time is essential to spiritual growth. As the week comes to an end, I find myself reflecting back on the week’s events. I often utilize Doreen Virtue’s “Magical Mermaids & Dolphins” oracle deck to glean insight on own path, so tonight I decided to pull a card. 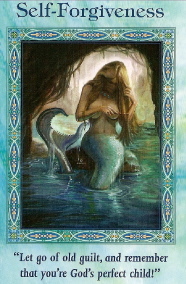 "Magical Mermaids & Dolphins" by Doreen Virtue, Ph.D. The card I pulled was entitled “Self-Forgiveness,” as shown above. When we receive signs and signals from Spirit, they are always consistent and positive. As Doreen Virtue often tells her own clients, true guidance is always positive and it will repeat itself over and over until you get the message. This has been the case regarding this message for myself, especially this week. According to the accompanying booklet, this card speaks to our inclination to beat ourselves up to the point of being almost abusive. Having high standards for yourself is healthy, but to take it too far can be destructive. The main point is that everyone makes mistakes. We are not infallible, but many of us expect perfection entirely too much of the time. This puts undue stress on us and distracts us from the lessons we are learning here. We didn’t come here to be perfect. We come here to experience. How we perceive our mistakes is more important than the mistakes themselves. Judging yourself too harshly is damaging to your self-esteem, and from there it can domino into other areas of your life. This week, in my own life, I received this message several different ways. I’ll share them here. For one, I started a new job not too long ago which requires a lot of multi-tasking and manual procedures. There are many opportunities for error, and yet somehow after working only a week or two on the job, I expected utter perfection of myself. My thoughts were very self-critical. I often blame this on my Catholic school education which was very strict, but some of it is self-inflicted, I’ll admit. As I often say, once we have the awareness to know something is happening, then we have the power to change. Where did the self-forgiveness message come up? As many of you already know, my dialog with Spirit is somewhat open as I walk through my every day life, so I was picking it up intuitively. Of course, because my guides are subtle and do not push but guide, it was easy to ignore! 🙂 So they tried again. I added up my drawer and it totaled ‘666.’ No, it is not the sign of the beast! If you’re familiar with Doreen Virtue’s “Angel Numbers,” you know that this is a sign that my thoughts were out of balance and I was focusing entirely too much on the material world. As it is stated in the book, “Like the famous, “Sermon on the Mount” the angels ask you to focus on spirit and service, and know your material and emotional needs will be met as a result.” Once again, I’m not immune to being human, and it can be quite easy for someone as sensitive as myself to react to the environment around me without remembering my higher self’s perspective. It popped up one more time. As I stepped into the shower last night I decided to pop on Fiona Horne’s “Magickal Life: Guided Meditations and Spells for Positive Change.” (available for download on iTunes) I did not specifically choose any of the tracks, but found myself listening to one called, “Self-Love.” Part of this ritual entails using a hairbrush to brush away your fears and negativity, while repeating “I release this fear.” You’ll notice the card shown above echoes that sentiment. The act of grooming one’s self is an act of self-love, and is a kindness we can forget to show ourselves in times of crisis. So once again, Spirit’s message came through loud and clear- to be loving to one’s self and to release the guilt and negativity. The topic came up again, not for me but with regard to a friend who I gave a mini impromptu reading to this week. I had not seen her since we were 14 years old, and we decided to reconnect,. I mention this because I want to make it clear that I had no prior knowledge of what was about to transpire. We talked a bit about relationships, and she mentioned one of hers in particular had passed away. Her main reason for this was because she wanted to ask me about a recurring dream she had about him and wondered what it meant. As soon as she mentioned him, I felt the sensation of a spiritual presence, and let her know he was reaching out to us. Often when someone begins to talk about a loved one who has passed, it invites their energy to be present with us. I won’t go into too much detail, but one of the things that came through was that he is currently working on forgiving himself for some of the things he had done. Her eyes widened as she acknowledged a conversation she had with him prior to his passing about this very topic. “He asked me if I forgave him for the things he had done, and I told him that I did, but that he needed to forgive himself,” she said. It was an important confirmation for her, and as all readings are very personal, this was no exception. So for those of you who wonder about what happens to us on the other side when we’ve had a life that caused pain to others– we do not escape ourselves. What we do not finish here is carried with us and we are given new opportunities to make amends, even after physical death. Spirit’s message for all of us is this- be kind, patient and loving with yourself. We are like tiny blades of grass covered in morning dew, waiting for the sun to warm us so we can grow. Growth takes time, and we are being provided with everything we need so we can progress in our evolution as souls. In the eyes of God, we are already perfect, and to quote my friend and mentor, Spirit Medium Jackie Waitkus, “we cannot make a mistake.” Our choices simply alter our path and direction. What we, as humans, see as a mistake can turn out to be the most important opportunity we create for ourselves. ~ by healingstarspirit on January 13, 2012. Thanks, Korin! And yes, it was yesterday! LOL An hour later I counted it again and it was 777. Get that Angel Numbers, it will be a real eye-opener. Your True Identity Is Spirit!